Alexander (Aleksandr) Alexanderovich Alekhine (some sources say it is pronounced Al-YEH-khin, others say al-YEKH-een) was born on October 31, 1892 (New Style) in Moscow, Russia. This would have been October 19, 1892 on the Old Style or Russian calendar (the Russians switched from the Old Style Julian calendar to the New Style Gregorian calendar in 1918). Alekhine's My Best Games of Chess 1908-1927, has two biographical notes. The first biographical note states that he was born on October 19, 1892. The second biographical note states that he was born on November 1, 1892. ChessBase and Caparrios & Lahde also state that he was born on November 1, 1892. The November 1 day is an incorrect conversion from Old Style to New Style. The Julian calendar lags behind the Gregorian calendar 12 days in the 19th century and 13 days in the 20th century. If Alekhine was born on October 19, Old Style, then 12 days added to October 19 is October 31, not November 1. His father, Alexander Ivanovich Alekhine (1856-1917), was a wealthy landowner, a marshal of the nobility and privy councilor of the Fourth Duma (1912-1917), a legislative assembly (lower parliament house) in the late Russian Empire established by Tsar Nicholas II. He was also the ex-governor of Voronezh, a southern province. Alekhine’s father spent several winters on the French Riviera where it is reported that he lost 15 million rubles at the gambling tables in Monte Carlo (CHESS, May 1946). His mother, Anisya Ivanova Prokhorova Alekhina (1861-1915), daughter of a Moscow industrialist, was an heiress to a textile fortune. He had an older sister, Varvara (Barbara) (1889-1944), and an older brother, Alexei (1888-1939). On November 10, 1892 (Old Style), Alekhine was baptized. Bothe parents were orthodox Catholics. His god-parents were Staff Captain Ivan Yefimovich Alekhine and his wife, Anna Sergeyevna Prokhorov. Until World War I, Alexander Alekhine spelled his last name Aljechin. As a child, Alexander's nickname was Tisha. Some of his earlier correspondence games were written T. Alekhine (Tisha Alekhine) since he and his brother were both A.A. Alekhine. Alexander grew up in Moscow, on Arbat Street, close to Smolensk Square. Some sources say that Alexander learned chess from his older brother, Alexei (Aleksei) Alexandrovitch, around 1898-99. Divinsky and Moran say that Alexander learned chess from his mother at age seven. Hooper and Whyld say that both Alexei and Alexander were taught chess by their mother. Kasparov says that Alexander began playing at the age of 7, and his main opponent was his older brother Alexei (Alexey). During a radio interview in the Netherlands in 1934, Alekhine said he learned how to play chess from his older brother at the age of 7, and was not allowed to play chess outside his house until age 14. Alexander started recording his chess games in 1900. Divinsky states that in 1900 Alekhine's family hired the well know master Fyodor Duz-Khotimirsky (1979-1965) to give Alexander chess lessons for 15 rubles. Kasparov says that the Alekhine home was visited by some well-known masters such as Duz-Khotimirsky, Blumenfeld, and Nenarokov. In 1902, Alexander Alekhine watched Harry Pillsbury (1872-1906) play 22 boards blindfolded in Moscow. That experience left a powerful impression on Alexander Alekhine and he became more devoted to chess. One of the Moscow players who played against Pillsbury was Alexei Alekhine, Alexander Alekhine's older brother. Alexei drew with Pillsbury. Alekhine's first known game was from a correspondence tournament that began on December 3, 1902, when he was 10 years old. He recorded his first games in a notebook. By 1902 he was playing correspondence chess sponsored by Shakhmatnoe Obozrenie chess magazine. At the time, it was Russia's only chess magazine. The name of A A Alekhine appeared in the 6th (1902-1903), 7th (1903-1904), 9th (this may have been Alexei Alekhine), 10th, 13th, 16th (1905-1906), 17th (1909-1910), and 18th (1910-1911), correspondence chess tournaments of the magazine. In the 6th Correspondence Tournament (1902-1903), Alekhine took 6th place. He won 9 games, drew 1 game, and lost 8 games. In the 7th Correspondence Tournament (1903-1904), Alekhine took last place, with 2 wins, 1 draw, and 9 losses. Hooper and Whyld say that Alexander became addicted to chess about age 11, playing in his head during lessons, and by the light of a candle when in bed. Garry Kasparov tells the story that once in an algebra test, Alekhine suddenly leaped up with shining eyes. The teacher asked if Alekhine had solved the problem. Alekhine responded, "Yes, I sacrifice the knight, and White wins!" The class burst our laughing. At the age of 12, Alekhine could analyze his games blindfolded without sight of board. He analyzed his games in his head during school hours. Alekhine won the 16th Correspondence Gambit Tournament of the chess magazine Shakhmatnoe Obozrenie, which took place during 1905-1906. Alekhine considered this his first serious tournament. He won 10, drew 3, and lost 1 game. In 1906-1907, he played in the first Prince F. M. Shakovskoi Correspondence Tournament, and tied for 4th-5th (+6-1=1). In late 1907, Alexander played in the Moscow Chess Club Autumn tournament. He tied for 11th-13th place (+4-9=1). His brother, Alexei, tied for 4th-6th place. In 1907, Alekhine wrote Chess parties of A. Alekhine. It was never published. In 1907-1908, he played in the second Prince Shakovskoi Correspondence Tournament. In 1908, Alekhine won the Moscow Chess Club Spring Tournament at the age of 14. In August 1908, Alekhine, age 15, played in the non-master section of the 16th Congress of the German Chess Federation (Union) in Dusseldorf and took 4th-5th place (+8 -3 =2). In August 1908, he defeated Curt von Bardeleben (1861-1924) in a match, held in Dusseldorf, with 4 wins and one draw. Alekhine observed the Lasker-Tarrasch world championship match while in Dusseldorf. Lasker and Tarrasch played their first four games in Dusseldorf from August 17 through August 24, 1908, before it moved on to Munich. First to win 8 games would be the champion. Lasker won 8, lost 3, with 5 draws. Lasker won 3 games and lost 1 game while in Dusseldorf. The match moved on to Munich and Alekhine also went there to observe the match. In September 1908, Alekhine drew a match with Hans Fahrni (1873-1939) in Munich (+1-0=1). In October 1908, he played a match with Benjamin Blumenfeld (1884-1947) in Moscow and won with 7 wins and 3 losses. At age 16 he entered the Imperial High School for Law in Moscow. In October 1908, Alekhine lost a match against Vladimir Nenarokov (1880-1953), who was Moscow champion in 1900, 1908, and 1924. Alekhine lost all three games to Nenarokov (they were supposed to play 6 games, but Alekhine abandoned the rest). In January 1909, he won the Moscow Chess Club Autumn Tournament for first category players (+5-1=3). This gained him entry to the St. Petersburg All Russian Amateur Tournament. In February, 1909, at the age of 16, Alekhine traveled to St. Petersburg to play in the All Russian Amateur Tournament. He won the tournament (+12-2=2) which gained him the Russian National Master title. First prize was a cut glass Sevres vase valued at 650 rubles, donated by the Czar and Czarina and decorated with the Imperial Russian shield. He was the youngest player in the tournament. In March 1909, Alekhine had to have an operation for appendicitis. In 1909, Alexander entered the St. Petersburg Military Academy. In August 1909, he won a triangular tournament at Sevastopol. One of his opponents was V. Karpov. In 1909-1910, Alekhine played in the 17th Shakhmatnoe Obozrenie Correspondence Tournament and won it by a wide margin. In March 1910, he won the Moscow Chess Club Autumn and Winter Tournament. In March 1910, Alekhine gave his first simultaneous exhibition. In Moscow, he played against 22 boards, winning 15, losing 1, and drawing 6. In 1910 Alekhine finished Military School at St. Petersburg. In July-August, 1910, Alekhine participated in the master section of the 17th German Chess Congress (DSB) in Hamburg and tied for 7th-8th place with Duz-Khotimirsky. Carl Schechter took 1st place, followed by Duras, Nimzovich, Spielmann, Marshall, and Teichmann. In May 1911, he won the Moscow Chess Club 3rd Handicap Tournament and the Moscow Chess Club billiard system (knockout) Tournament. In May 1911, he played Board 1 for the Moscow Chess Club in a match against the St. Petersburg Chess Club. He drew his game with Eugene Znosko-Borovsky (1884-1954). In 1911 Alekhine defeated Stepan Levitzky (1876-1924), a Russian master, in a match, scoring 7 wins and 3 losses. In August-September 1911, he played in the 2nd International Tournament in Carlsbad and ended up in 8th-11th place. The event was won by Richard Teichmann, followed by Rubinstein, Schlechter, Rotlewi, Marshall, Nimzovich, and Vidmar. By the end of 1911, Alekhine moved to St. Petersburg where he entered the Imperial Law School for Nobles. By 1912, he was the strongest chess player in the St. Petersburg Chess Society. He was offered the position as games editor of the chess column in Novoe Vremya. In March 1912, he won the St. Petersburg Chess Club Winter Tournament. One of his opponents was Vassily Osipovich Smyslov (1881-1943), father of the future World Champion, Vasily Smyslov. Smyslov Senior beat Alekhine in their game. In April 1912, he won the 1st Category Tournament of the St. Petersburg Chess Club. He also played Board 1 for the Moscow Chess Club against the St. Petersburg Chess Club. He drew his game with E. Znosko-Borovsky. In July, 1912 he won a minor tournament in Stockholm, the Nordic Masters Congress, with a score of 8.5 out of 10. In August-September 1912, he played in the All Russian Masters Tournament in Vilna. He tied for 6th-7th. The event was won by Rubinstein, followed by Bernstein, Levitsky, Nimzovich, and Flamberg. Alekhine had his only minus score in his career from this tournament. He won 7 and lost 8. In February-March 1913, Alekhine defeated S. M. Levitsky in a match held in St. Petersburg with 7 wins and 3 losses. Years later, he published and falsified a game score from this match, showing a brilliant combination that never occurred. In April 1913, he tied for 1st with Levenfish in the St. Petersburg Masters Quadrangular Tournament. Alexander Alekhine's brother, Alexei, was editor of the chess journal Shakmatny Vyestnik from 1913 to 1916 and Alexander was a frequent contributor. In August 1913, he won the 40th Anniversary of the Nederlandschen Schaakbond (NSB) Commemorative Tournament in Scheveningen. He score 11.5 out of 13. In 1913, at the age of 21, Alekhine fathered an illegitimate daughter, Valentina (born on December 15, 1913) with a Russian baroness (Anna von Sewergin). Alekhine and the baroness married in 1920 to legitimize the daughter's birth (Moran and Hooper & Whyld). Valentina died in the mid 1980s in Vienna. In September 1913, Alekhine defeated Edward Lasker in a match in Paris and won 1,000 francs. Shortly after that, his 1,000 francs was stolen. He had to borrow money from Edward Lasker to return home. In January 1914, at the age of 22, he won his first major Russian tournament when he tied for first place with Aron Nimzovich (Nimzowitsch) in St. Petersburg, the All Russian Masters Tournament. Alekhine and Nimzovich played a min-match, and that was tied, each scoring one win. Both were then allowed to play in the 'tournament of champions' in St. Petersburg. A few months later, in April-May 1914, another major tournament was held in St. Petersburg in which he took third place behind Emanuel Lasker and Jose Capablanca. Czar Nicholas II conferred the title "Grandmaster of Chess" to Lasker, Capablanca, Alekhine, Tarrasch, and Marshall after they took the top five places at St. Petersburg. The Czar also contributed 1,000 rubles towards the prize fund. During the spring of 1914, Alekhine successfully completed his course at the law school in Saint Petersburg, but never practiced. Alekhine's book, My Best Games of Chess 1908-1937, states in one of its biographical notes that he obtained his law degree in 1914, then entered the Russian Foreign Office (Foreign Relations Ministry). In July 1914, Alekhine tied for 1st with Marshall at the International Tournament in the Cafe Continental in Paris. In 1914, Alekhine composed his only known chess problem, a mate in three. Alekhine decided to play in the main tournament in Mannheim, the 19th German Chess Federation (DSB) Congress. He arrived two hours before the start of the event on July 20, 1914, and would only play if Capablanca was not participating. Capablanca did not play in the event. World champion Emanuel Lasker was a guest of honor at the event, but left before World War I broke out on August 1, 1914. Lasker was there to make plans for an International Chess Federation. On August 1, 1914, Alekhine was leading in the tournament with 9 wins, 1 draw and 1 loss when World War I broke out. The congress was stopped on August 1, the day Germany declared war on Russia. The last 6 rounds were cancelled. After the event was stopped, the leaders were Alekhine, Vidmar, Spielmann, Breyer, Marshall, Reti, Janowski, Bogoljubow, Tarrasch, Duras, John, Tartakower, Fahrni, Post, Carls, Kruger, Flamberg, and Mieses. There were 17 other players in the next section (Hauptturnier A), and 50 players in the bottom section (Hauptturnier B). Alekhine was scheduled to play Capablanca in September after being invited by the Buenos Aires Chess Club. Now he was unable to get out of Germany. Alekhine received 1100 marks (equivalent to 11,000 Euros in terms of purchasing power today) for his first place finish at Mannheim. All the foreign players were taken to a Mannheim police station, and then later released except for Alekhine. He was detained because he had a photograph of himself wearing the uniform of the law school he attended. The police had taken him for a Russian officer. He spent the night in jail until it was later resolved. Later, the “Russians” were transferred to a military prison in Ludwigshafen, opposite of Mannheim on the other side of the Rhine river. The eleven “Russian” players (Alekhine, Bogoljubow, Bohatirchuk, Flamberg, Koppelman, Maljutin, Rabinovich, Romanovsky, Saburov, Selezviev, and Veinstein) were taken to Rastatt, Germany as a prisoner of war on August 4, 1914. They were supposed to be taken to Baden-Baden, to settle there in private quarters and to await further orders. But the conductor of the train stopped at Rastatt and informed the commandant of the town that he had a suspicious group of foreigners. The military soldiers went through their luggage and found the chess score sheets with the recordings of the chess moves from the tournament. The military thought this was secret code for the transmission of spy messages. They were beaten up by people in the street, thinking they were all spies against Germany. All the chess players were put in a civil prison. Alekhine was put in a cell with Bogoljubow, and they played blindfold chess for hours. Later, Alekhine was put in solitary confinement for four days. Within a couple of weeks, they were finally all sent to Baden-Baden and moved in a hotel. Later, they all had to pass through a medical commission to see if anyone was a danger to Germany. Alekhine was certified as unfit for military service on September 14, 1914. A doctor may have been an admirer of Alekhine's chess genius, and released him. Some sources say that Alekhine was released for feigning madness. Moran states that family influence and the International Red Cross mediation procured Alekhine’s release. Bohatirchuk, Saburov, and Koppelaman were released a few days later as unfit for military service. Alekhine made his way back to Russia. Julius du Mont states that Alekhine escaped to Switzerland and returned home, via Siberia, to join the Russian army. Hooper and Whyld say that Alexander returned to Russia in October, 1914 via Switzerland, Italy, England, Sweden, and Finland. Alekhine left for Basel, Switzerland, and then went to Genoa, Italy, which was an Italian port for Russians caught in Europe. Alekhine was stuck in Genoa for a month and played hundreds of chess games with Fedor Bohatirchuk (1892-1984), who was also released from Baden-Baden and was waiting for a ship in Genoa to take him back to Russia. Alekhine was planning to go to Buenos Aires to play Capablanca in a chess match, but this came to nothing. Alekhine next sailed for Gibraltar, then England, and arrived in London on October 9, 1914. He then went to Stockholm, Sweden where he gave a simultaneous exhibition on October 21, 1914. He then went to Finland, and then arrived back in Petrograd (St. Petersburg) before the end of October. From there, he went to Moscow. When Alekhine arrived back in Russia, he helped raise money to aid the Russian chess players who were still interned in Germany (now imprisoned in Triberg) by giving simultaneous exhibitions. On December 28, 1915, Alexander's mother died. His father spent more than a year in a German prison. In December, 1915 Alekhine won the Championship of the Moscow Chess Club with 10.5 out of 11. In May, 1916, Alekhine served as an attaché in the Union of Cities (Red Cross) on the Austrian front as head of the mobile dressing station. He gave help to the wounded at the front. In August-September, 1916, Alekhine twice suffered from shell shock while on the front line and was twice decorated (du Mont). He later had to be confined to bed in the Cloisters military hospital in Tarnopol (Ternopil), a town in Eastern Galicia (formerly Austria), now in western Ukraine. During World War I, the city passed from German and Austrain forces to Russia several times. In September 1916, he was playing 5 people in a blindfold display at a Russian military hospital at Tarnopol. He won all his games. After leaving the hospital, Alekhine returned to Moscow, where he was awarded the Order of St. Stanislav (Stanislaus) and two St. George Medals. (Kasparov) He was also decorated with the Red Cross insignia (1st and 2nd degrees). In October 1917, after the Bolshevik revolution, chess was officially discouraged in Russia as a "decadent bourgeois pastime." Virtually all organized chess activities and chess clubs ended in Russia. Alekhine lost whatever remained of his parents’ fortune. His mansion was confiscated by the Bolsheviks. In 1918, chess activity picked up due to the influence of Alexander Ilyin-Zhenevsky (1894-1941). He was the Chief Government Commissar for General Military Organization. As a strong player himself, he encouraged and organized chess activities in Russia as part of the campaign to promote culture and education in the Red Army. However, many chess players had to play tournaments and matches at homes and apartments since chess clubs were still not allowed. In 1918, Alekhine finished his legal training and worked at the Moscow Criminal Investigation Department as an examining magistrate. While in Odessa, Alekhine stayed in a hotel room previously occupied by a British Officer of the Intelligence Service. This British officer left behind a trunk. During a police raid, the trunk was found to contain compromising documents. Alekhine was then arrested and sentenced to death (CHESS, May 1946). In June 1919, Alekhine was briefly imprisoned in Odessa's death cell by the Odessa Cheka, suspected of being a spy. He was charged with links with White counter-intelligence after the Russians liberated the Ukraine from German occupation. He was sentenced by a Revolutionary tribunal to be shot by a firing squad. Some sources say that Leon Trotsky himself spared Alekhine’s life. Yakov Vilner (1899-1931) was the 1918 Odessa chess champion. He heard about Alekhine’s arrest and sent a telegram to the Ukrainian Chief Commissar, Khristian (Christian) Rakovsky (1873-1941), who knew Alekhine Ravovsky gave the order to free Alekhine. Alekhine then returned to Moscow. Reuben Fine states that Alekhine was in a Cheka jail in Odessa for two weeks, from which he escaped by going to a foreign chess tournament. In the Russian émigré circles, Alekhine was held to be responsible for the arrest and death of many White Russians in 1919 (CHESS, May 1946). In 1920 he was in a forced labor brigade working on the Trans-Siberian railway with former members of the Russian aristocracy. In January 1920, he won the Moscow City Championship (11 out of 11), followed by N. Grekov (8.5 out of 11). Grekov was declared the first Moscow Chess Champion because Alekhine's score did not count (hors de concours). He wasn't a resident of Moscow at the time. In early 1920, Alekhine married Anna von Sewergin (some Internet genealogy sources say Aleksandra Bataeva), a Russian baroness several years older than he (Moran). She was an artist from St. Petersburg and widow of a Russian landowner killed in World War I. This was his first wife. They married in Moscow to legitimize their seven-year-old daughter, Valentina (Hooper and Whyld). There is no record of a divorce. In May 1920, Alexander found work in Moscow as an investigator for the police central investigation department. He helped people who lost one another during the War. He also joined a chess club and got involved with chess again. The June, 1920, issue of the British Chess Magazine (BCM) reported on the disappearance of Alekhine and feared he was killed by the Bolsheviks. There were reports that Alekhine had been executed in Odessa. The February, 1921, issue of BCM finally reported that Alekhine was alive and doing well. In the summer of 1920, Alekhine was transferred from the central investigation department to the Communist International (Comintern) as an interpreter since he was fluent in French and German. He became a candidate member of the Communist Party and was secretary of the Communist Education Department. In the July, 1920 he met a 41-year-old Swiss woman journalist, Red Cross nurse, and Comintern delegate Anneliese (Anna-Luiza or Annaliene) Ruegg (1879-1934). She had come to Russia as a delegate to the Second Congress of the Comintern International, and later interviewed Vladimir Lenin in November, 1920. The Comintern assigned Alekhine to interpret at the congress, since he was fluent in French and German from boyhood. In October, 1920 Alekhine won the first Soviet (or USSR retro-actively) chess championship (called the All-Russian Chess Olympiad at the time) in Moscow. His score was 12 out of 15 and he went undefeated. His brother, Alexei, took 3rd place in the tournament for amateurs. It was the last event that the two brothers played in together. This event was organized by the Universal Military Training Organization as part of an all Russian Sports Olympiad. The chess event was directed by Alexander Ilyin-Zhenevsky. The Sports Olympiad never materialized, but the chess event went ahead. The top event incorporated the championship of the Russian Soviet Federative Socialistic Republic (RSFSR). The USSR was not founded until 1924 (dissolved in 1991). All the chess players were mobilized and were in the Army and given travel facilities to get them to Moscow. This was Alekhine’s last tournament in Russia. In November 1920, the Moscow secret police brought a new case against Alekhine after hearing from their Odessa branch. Later, the charges of ‘anti-Soviet activity’ were dropped. Alekhine and Ruegg got engaged on December 25, 1920. In early 1921, Alekhine’s first wife, Anna von Sewergin, and daughter, Valentina, left for Austria. On March 15, 1921, Alekhine married a second time to Anneliese Ruegg, who was 13 years older than he. She was 41 and he was 28. He may have not divorced his first wife at the time. Anneliese was already expecting a baby, and wanted to have the birth back home in Switzerland. Shortly after, on April 29, 1921, Alekhine was given permission to leave Russia for a visit to the West with his wife. Alekhine never returned to Russia. The couple traveled to Riga, Latvia, and Berlin, where he only had 200 marks in his pocket. Alekhine wanted to go to France and from there, tour the world playing chess. But the entry visa into France was refused by the French Consulate. Alekhine finally obtained a visa on the understanding he would not undertake any communist propaganda. In June 1921, Annaliese returned to Switzerland, where she gave birth to a son, Alexander Aleksandrovich Aljechin, in early 1922. In 1921, Alekhine drew a match against Richard Teichmann (1868-1925) with two wins, two draws, and two losses. He then took first place at Triberg (July), Budapest (September), and The Hague (November). Alekhine won three straight tournaments in Triberg, Budapest, and The Hague, without losing a game. In Budapest he popularized what is now called the Alekhine's defense (1.e4 Nf6). By then, he had adopted the French version of his name - Alexandre Alekhine. In November 1921, Alekhine challenged Jose Capablanca (1888-1942) for a world championship match. A match was suggested to be played in the United States in 1922. In 1921, Alekhine published his first book, was Das Schachleben in Sowiet-Russland. (Chess Life in Soviet Russia). It was only 16 pages and was published in Berlin by Kagan. He also wrote Weittkampf Alejechin-Bogoljobow, Triberg 1921, but it was never published. Alekhine wrote no books in Russian. Alexander's brother, Alexei, remained in Soviet Russia and denounced his brother. Alexei won the championship of Kharkov in the Ukraine and served as the Executive Board member of the USSR Chess Federation. He was also the Secretary of the Ukrainian Chess Federation and the editor of the first Soviet chess annual, published in 1927. In January 1922, his son, Alexander (Alex) Aleksandrovich Aljechin, was born in Switzerland. His mother was Anneliese Ruegg. In March 1922 a candidate match was supposed to take place between Alekhine and Akiba Rubinstein (1882-1961). The winner was supposed to be recognized by Capablanca as the official challenger to a world championship match. The match never took place. In April 1922, Alekhine tied for 2nd-3rd (with Spielmann) in the Breyer Memorial Tournament in Pistyan. The event was won by Bogoljubow. In is game with Treybal, Alekhine stated that one of his combinations in that game was the longest he had ever undertaken, claiming a winning maneuver that he saw 20 moves ahead. In 1922, Alekhine first visited Gijon, Spain. On June 25, 1922, he played 34 boards at the Royal Asturian Regatta Club and won all 34 games in record time. In August 1922, Alekhine took 2nd at the 15th British Chess Federation Congress (known as the London victory tournament). The event was won by Capablanca. This was the first event after the War that Alekhine and Capablanca played against each other. The participants of the tournament signed the so-called London agreement on August 9, 1922, which were the regulations for world championship matches., first proposed by Capablanca. The signers of the London Rules included Alekhine, Capablanca, Bogoljubow, Maroczy, Reti, Rubinstenin, Tartakower, and Vidmar. Clause one of the London Rules stated that the match to be one of six games up, drawn games not to count. In December 1922, Alekhine took 4th-6th at the Austrian Chess Association Congress, held in Vienna. The event was won by Rubinstein, followed by Tartakower and Wolf. This was the last meeting between Alekhine and his first wife, Anna von Sewergin, who was living in Austria with their daughter, Valentina. They never met again. It was in Vienna that Ernst Gruenfeld beat Alekhine when he played the Gruenfeld’s Defense against Alekhine. Alekhine resigned by taking his king and throwing it across the room (Kmoch , Schonberg, Moran). In April 1923, Alekhine took 2nd-5th at the Kent County Chess Association Congress in Margate. The event was won by Gruenfeld. In May 1923, he tied for first at Carlsbad with Bogoljubow and Maroczy. Reinfeld and Kmoch writes that after losing to Spielmann at Carlsbad, Alekhine went back to his hotel room (the Imperial, the best hotel in Carlsbad) and smashed every piece of furniture in his room. Alekhine lost three games at Carlsbad (Chess Review, May 1950). In November 1923, Alekhine challenged Capablanca for a second time. In April 1924, he took 3rd place in New York, behind Lasker and Capablanca. Alekhine spent much of 1924 annotating all the games from the New York tournament. In 1924, Alekhine divorced his second wife, Anneliese Ruegg. Her social commitments and refusal to accompany Alekhine to chess tournaments led to marital problems. In 1924, at a Paris ball, Alekhine met Nadezhda Semyenovna Fabritskaya (Fabrickaja) Vasiliev (Vasileva or Wasilief), widow of the Russian General V. Vasiliev. She was born on March 19, 1884 in Odessa. Her daughter, Gvendolina, was almost as old as Alekhine. In 1924, he wrote Book of the Hastings International Masters Chess Tournament 1922, published in London. He also wrote Mis mejores partidas 1908-1923, published in Madrid by Afrodisio Aguado. On February 1, 1925 Alekhine broke his own world blindfold record by playing 28 games blindfold simultaneously, winning 22, drawing 3 and losing 3. The event took place in Paris. In May 1925, Alekhine won a tournament in Baden-Baden (+12-0=8). This was the first international tournament in Germany since World War I. Alekhine’s game with Reti was considered one of the finest games that he ever played. In 1925 Alekhine entered the Sorbonne Law School, and wrote his thesis on the Chinese prison system (The System of Imprisonment in China). He did not get his PhD and only completed two of the four stages required for the degree (Hooper and Whyld). However, he started introducing himself as Doctor Alekhine. J. du Mont states that he obtained his Degree of Docteur en Droit (Doctor of Law) at Paris University. Brace states that he received a doctorate in law from the Sorbonne, but never practiced law because of his passion for chess. Horowitz says that the "Dr." was for a degree in jurisprudence. Divinksy says that it is doubtful that Alekhine graduated from the Sorbonne. Kasparov says that Alekhine did become a Doctor of Law. Alekhine himself started signing his name as "Dr Aljechin" after 1925. In 1925, he married his third wife, Nadezhda Semyenovna Fabritskaya Vasiliev. They lived at 211 rue de la Croix-Nivert in Paris. Kotov claims that Alekhine divorced his second wife, Anneliese, to marry Nadezhda. In 1925, he wrote Das Grossmeister turnier New York 1924, published in Berlin and Leipzig by De Gruyter. Also in 1925, Alekhine and Hermann Helms wrote The Book of the New York International Chess Tournament, 1924, published by the American Chess Bulletin (ACB). His New York 1924 book was also published in German, Russian. After World War II, it was published in Spanish. In January 1926, he tied for 1st with Vidmar in the 6th Hastings Congress of 1925-26. In March 1926, he took 2nd at the International Tournament in Semmering. The event was won by Spielmann. In April 1926, Alekhine took 2nd at the Dresden Chess Club 50th Year Jubilee Congress. The event was won by Nimzovich. In May 1926, Alekhine won a tournament at Scarborough. In June 1926, Alekhine won a tournament at Birmingham. In October 1926, Alekhine won a tournament at Buenos Aires. At this time, he challenged Capablanca again. The Argentine government undertook to guarantee the finances of the match. Alekhine spent several months touring South America and giving exhibitions. In 1926, he wrote La valeur theoretique du tournoi de Baden-Baden, published in Brussels. In 1926-7 Alekhine beat Max Euwe in a match with 3 wins, 5 draws, and 2 losses. Alekhine then challenged Jose Capablanca for the world championship. In March, 1927 Alekhine took second place ($1,500), behind Capablanca ($2,000), in New York, with 5 wins, 13 draws, and 2 losses. It was in New York that Capablanca, Alekhine, and the Argentine organizers finally reached an agreement about the world championship match. The winner would be the first person with six wins, draws not counting. In July he won at Kecskemet 1927. Jose Capablanca accepted the challenge and began their world championship match in Buenos Aires on September 16, 1927. The Argentine Chess Club (Club Argentino de Ajedrez) of Buenos Aires put up $10,000 (40,000 pesos). $4,800 was to go to the winner, $3,200 was to go to the loser, and $2,000 was for Capablanca’s appearance fee. The match between Capablanca and Alekhine saw 32 out of 34 games with the same opening, the Orthodox Defense of the Queen’s Gambit Declined. On November 26, 1927, Alekhine became a naturalized French citizen. While in France, he called himself a White Russian. When he obtained his French naturalization, he became a French patriot and said he was proud to enhance the prestige of France in foreign countries through his chess. On November 29, 1927 Alekhine beat Capablanca with 6 wins, 25 draws, and 3 losses to become fourth chess champions of the world. The only time-out was when Alekhine had 6 teeth extracted during the match. After the final game, Alekhine was carried through the streets of Buenos Aires by a crowd of 10,000 chess fanatics. Alekhine became the 4th official world champion of chess after Steinitz, Lasker, and Capablanca. All the games in Buenos Aires took place behind closed doors. There were no spectators or photographs. The winner was the first to win 6 games. Before the match, the score between the two opponents was 4 wins, 5 draws, and 0 losses in favor of Capablanca. Before the match, Spielmann predicted that Alekhine would not win a single game. On December 12, 1927, Alekhine and Capablanca had their last meeting in Buenos Aires. They discussed the conditions for a new match. Capablanca suggested limiting the number of games, but Alekhine liked the rules as they were. Nothing more was suggested and they parted. After the match, Alekhine avoided the required return match with Capablanca, and refused to play in any event that Capablanca was in. He forced organizers to drop Capablanca from any invitations if they wanted Alekhine to play. Capablanca was not invited to San Remo 1930 and Bled 1931 because Alekhine was invited, but would not play if Capablanca participated. This continued until 1936 (Capablanca and Alekhine played in Nottingham 1936), after Alekhine had lost the title himself to Max Euwe. At Nottingham, Capablanca defeated Alekhine in their encounter. In 1927, AlexanderAlekhine wrote Moi luchshie partii, published in Moscow and Leningrad (St. Petersburg). He also wrote My Best Games of Chess 1908-1923, published in London and New York. Alekhine and Max Euwe wrote De Schaakwedstijd Aljechin-Euwe, 1926, published in Amsterdam in the Dutch language. In 1927, Alekhine’s brother, Alexei, wrote Match na pervenstvo mira Alekhin-Capablanca, published in Kharkov. After the world championship match, Alekhine returned to Paris and spoke against Bolshevism at the various clubs around the city. Afterwards, Nikolai Krylenko (1885-1938), president of the Soviet Chess Federation, published an official memorandum stating that Alekhine was the enemy of the Soviets and should be treated as an enemy. The Soviet Chess Federation broke all contact with Alexander Alekhine. Newspapers in the USSR published a letter by Alexei Alekhine that he rejected Alexander Alekhine and was finished with him forever. In 1928, FIDE held its congress at The Hague. Alekhine, the reigning world champion, attended part of the 1928 Congress. He agreed to place future world championship matches under the auspices of FIDE, although any match with Capablanca had to be played under the same conditions as in Buenos Aires. In 1928, he was co-author of Das erste International Schachturnier in Kecskemet, 1927 with Hans Kmoch, Geza Maroczy, and Aron Nimzovich. Alekhine also wrote Das New Yorker Schach-Turnier, 1927, published in Berlin and Leipzig. In 1929, Alekhine attended the 1929 FIDE Congress in Venice, Italy. In June 1929, he won at Bradley Beach, New Jersey. Bradley Beach offered to host a Capablanca-Alekhine return match, but Alekhine refused and accepted a challenge from Efim Bogoljubow (1889-1952). Alekhine avoided Capablanca's challenge of a re-match and took on Bogoljubow at Wiesbaden (first 8 games), Heidelberg (3 games starting October 3), Berlin (6 games), The Hague, and Amsterdam from September 6 through November 12, 1929. Alekhine won with 11 wins, 9 draws, and 5 losses. He avoided Capablanca by insisting that the winner get $10,000 in gold, just as he got on Buenos Aires. But after the stock market crash in October, 1929, there were no backers. Alekhine had a small fortune until the 1929 financial crash, in which he lost almost everything. In February 1930, he won at San Remo (+13-0=2). At the 3rd Chess Olympiad, held in July 1930 in Hamburg, he scored his first 100% score when he won all 9 games as board one for France. Capablanca is there as a spectator, but Alekhine and Capablanca avoid each other. In July 1931, Alekhine played Board 1 for France at the 4th Olympiad, held in Prague. He won 10, lost 1, and drew 7. His loss to Mattison was his first loss in a serious chess event since winning the world championship. In September 1931, he won at Bled. He won by a margin of 5 1/2 points over his nearest rival (Bogoljubow). In February 1932, he won at London. On February 28, 1932, Alekhine played against 300 opponents in Paris (60 teams of 5 players each). He won 37, lost 6, and drew 17. In July 1932, he won the 36th Swiss Championship at Berne. On August 14, 1932, Alekhine arrived on the eve of the Chess Congress Masters Tournament at the Maryland Hotel in Pasadena, California. The event followed the 10th Modern Olympic Games at Los Angeles. Alekhine won the event at Pasadena and $250, with a score of 8.5-2.5. During this period, Alekhine, Isaac Kashdan, and Arnold Dake took a flight over Los Angeles and Pasadena on the Goodyear blimp Volunteer. From 1929 to 1932 Alekhine took first place at San Remo (performance rating of 2812), Bled, London, and Pasadena. In October 1932, he tied for 1st with Isaac Kashdan in Mexico City. In 1932, he wrote Auf deu Wege zur Weltmeisterschaft, 1923-1927, published in Berlin and Leipzig. Alekhine and Hatton-Ward wrote Sixty-Six Master Games Played in the London International Chess Tournament, 1932. The book was published in London and Philadelphia. In June 1933, Alekhine played Board 1 for France in the 5th Chess Olympiad in Folkestone. He won 8, drew 3, and lost 1 (to Tartakower). In 1933, Alekhine met Grace Freeman Wishart (sometimes given as Wishard, Wishaar, Wislar, or Wishar) at a minor chess tournament which she had won in Tokyo. Her prize was one of Alekhine's books (Deux cents parties d’echecs – 200 games of Chess). She asked him to sign the book and their relationship developed from that moment. Grace, born in New Jersey on October 26, 1876, was a widow of the English Captain Archibold Freeman, her third (possibly fourth) husband who died in the early 1930s. She had been previously married to a British tea planter in Ceylon and a French Morocco Governor (Moran). Grace retained her British citizenship to the end of her life. She owned a chateau called Saint-Aubin-le-Chef, located a few miles southeast of Dieppe in Normandy. She also owned an art studio in Paris. Soon, Grace was living with Alekhine, even though Alekhine was still married to his third wife, Nadezhda. He traveled the world giving simultaneous exhibitions. He was made an honorary Colonel in the Mexican army and appointed as chess instructor for the Mexican army. In October 1933, he won at Paris. In January 1934, he tied for 2nd, with Lilienthal, at Hastings 1933-34. The event was won by Flohr. In February 1934, Alekhine won at Rotterdam. In March, he divorced his third wife, Nadezhda in Amsterdam. On March 26, 1934 Alekhine married for the 4th time to Grace Wishart at Villefranche-sur-Mer in the French Riviera. The marriage certificate spells her maiden name as Wishaar. In April-June, 1934 Alekhine defeated Bogoljubow for the world championship in Germany with the score of 8 wins, 15 draws and 3 losses. He then accepted a challenge from Max Euwe. On May 2, 1934, Alekhine’s second wife, Annaliese Ruegg died in Luasanne, Switzerland. Alekhine put his son, Alex, in a boarding school in Zurich, Switzerland under the guardianship of the Swiss master Erwin Voellmy (1886-1951). Alekhine saw very little of his son. In July 1934, he won the 37th Swiss Championship in Zurich. It was here that Alekhine won his first and last game with Emanuel Lasker. In April 1935, Alekhine won at Orebro. In June 1935, Grace Alekhine played in the French Women’s Championship, but was not among the top four finishers. In August 1935, Alekhine played for France in the 6th Chess Olympiad in Warsaw. He won 7, drew 10, and lost none. He brought his wife and his favorite cat, a Persian cat named "Chess." At the end of August, 1935, Alekhine attended the FIDE Congress in Warsaw. He was part of a commission to make a list of candidates who had the right to challenge the world champion in the next world championship match. The list was based on the last known results. Capablanca came first, followed by Botvinnik. In 1935 Alekhine wanted to establish his residence in Mallorca, but his wife, Grace, disliked the idea. On October 3, 1935 the world championship match between Alekhine and Euwe began in Zandvort for $10,000 to the winner. On December 15, 1935 Euwe had won with 9 wins, 13 draws, and 8 losses. This was the first world championship match to officially have seconds to help in analysis during adjournments. Salo Landau, a Dutch Jew, was Alekhine's second and Geza Maroczy was Euwe's second. After the 26th game, Landau withdrew after a disagreement with Alekhine. In 1935, he wrote International und 37 Schweizerisches Schachturnier in Zuerich, 1934, published in Zurich. In July 1936, Alekhine took 2nd at Podebrady. Salo Flohr won the event. In August 1936, Alekhine played in Nottingham which was won by Capablanca and Botvinnik. Alekhine ended up in 6th place. His game with Capablanca was the first time they had met since the world championship match in 1927. In October 1936, Alekhine won at the ASB Jubilee tournament in Amsterdam. In October 1936, Alekhine took 3rd at the De Arbeiderspers tournament in Amsterdam. Euwe and Fine tied for 1st. In 1936, he wrote Deux cents partes d’echecs, 1908-1927, published in Rouen. Alekhine and Euwe wrote Aljechin-Euwe, Weltkampfbuch, 1935, published in German. In January 1937, Alekhine won the 17th Hastings tournament for 1936-37. He won 15 sterling pounds for his effort, His wife, Grace, won 3rd prize in the Third Class tournament at Hastings, winning 1 pound. In April 1937, Alekhine took 3rd at Margate. Fine and Keres tied for 1st. In July 1937, Alekhine took 4th-5th at Kemeri. Flohr, Reshevsky, and Petrovs tied for 1st. From October 5 to December 7, 1937, Alekhine played Euwe for the world championship match in various Dutch cities (The Hague, Rotterdam, Haarlem, Groningen, and Amsterdam). Alekhine did what no other world champion before him had been able to do - he regained the world championship in a return match. He won 10 games, drew 11, and lost 4. In 1937, he wrote The Book of the Nottingham International Chess Tournament, published in London. In March 1938, Alekhine won at Montevideo. In April 1938, Alekhine won at Margate. His wife, Grace, competed in Section A of the Second Class Tournament. In September 1938, Alekhine tied for 1st at Plymouth with Sir George Thomas. At the 1938 AVRO (Algemene Verenigde Radio Omroep) tournament in Holland on November 2-27, the top eight players in the world participated. This was the strongest tournament ever held. First place was $550. Alekhine, for the first time in his life, came ahead of Capablanca. Capablanca, for the first time in his life, scored below 50%. Capablanca, for the second time in his life, lost a game on time – to Alekhine. Flohr, the official challenger to Alekhine in the next world championship match (called off because of World War II) came in last place without a single win in 14 rounds. Alekhine tied for 4th-6th with his only even score in a tournament. He won 3 and lost 3. Keres and Fined tied for 1st. Botvinnik took 2nd place. In 1938, Alekhine and Euwe wrote The World Chess Championship, 1937, published in English. In 1939, Alekhine was representing France on board 1 at the chess Olympiad in Buenos Aires when World War II broke out. As team captain of the French team, he refused to allow his team to play Germany. In September 1939, he won a tournament at Montevideo. Alekhine could have remained in Argentina or he could have gone to the United States with his American-born wife, but decided to return to France to join the French Army. In January, 1940, Alexander and Grace (and two cats) sailed from Buenos Aires to Estoril, Portugal, where they stayed a few days before going to France. He returned to France in February, 1940, to enlist in the army as a non-commissioned officer. Owing to his knowledge of foreign languages, he was soon transferred to intelligence work and became an interpreter (he was a Lieutenant-Interpreter in the French Army). In June, 1940, after the Nazis occupied Paris, Alekhine was with his section at Arcachon, near Bordeaux. He then fled to the so-called unoccupied zone and was demobilized at Marseilles. From Marseilles, he wanted to leave for Portugal where he hoped to sail for South America so as to play a return match with Capablanca. But he was not yet 48 years old, and the French law prohibited all men under 48 from leaving France (CHESS, May 1946). He tried to obtain a passport both at Marseilles and at Nice, but could not do so, Alekhine then returned to Paris to see his wife, Grace. Alekhine then went to Spain. His wife had insisted on staying in Paris to protect their chateau at Saint Aubin-le-Cauf. She was an American citizen and could move throughout France a little bit more freely. It took Alexander nearly a year to get permission to leave for Portugal. In the autumn of 1940, he sought permission to enter Cuba. He also agreed to play a match with Capablanca if he were allowed to enter Cuba. In 1940 Alekhine estimated that he had played 50,000 chess games in his life to that point. He told friends he did not mind losing his title to a master of the younger generation such as Botvinnik or Keres. He did not want to lose to a player of his own generation. At this time, news reached Alekhine that his wife and chateau in France was in the hands of the Germans. To protect his wife and their French assets, including his six cats, he agreed to cooperate with the Nazis. He wrote six articles critical of Jewish chess players and participated in Nazi chess tournament is Munich, Salzburg, Warsaw, and Prague. The Nazis looted his French chateau at Saint Aubin-le-Cauf, near Dieppe. Mrs. Alekhine later sold the castle under American Embassy protection. (Chess magazine) The Germans refused Mrs. Alekhine an exit visa. Around December 1940, he was giving chess exhibitions in Paris for the German Army and Winter Relief. He played in no tournaments in 1940. In 1941, Ehrardt Post, General Secretary of the Grossdeutscher Schachbund (GSB), the Great German Chess Federation, wrote Alekhine that although he would not be allowed to return to France, if he consented to play in a chess tournament in Munich, his wife would be permitted to join him there. At the time, she was 62 years old and in failing health, Alekhine agreed to the terms. It is possible that the articles were falsified by Austrian master and chess journalist Theodor Gerbec (Herbertz), who was a chess editor of Pariser Zeitung, co-editor of Deutsche Schachzeitung, and a fascist. He died in 1945. In an interview quoted in a Madrid paper on September 3, 1941, Alekhine said he was proud of his articles that were published in the Pariser Zeitung. Alekhine gave two exhibitions and several interviews during this period. In 1941-1942 he participated in Nazi chess tournaments in Munich, Salzburg, Warsaw, and Prague. Alekhine was residing in Poland and Czechoslovakia during this time. In September 1941, he tied for 2nd-3rd at Munich. The event was won by Stoltz. The event was attended by leaders from the Nazi Party, the State Government, and the Wehrmacht. The reception was attended by Josef Goebbels and Dr. Hans Frank (1900-1946). In October 1941, he tied for 1st with Paul Schmidt at Cracow/Warsaw. In December 1941, he won at Madrid. In June 1942, he won at Salzburg. In September 1942, he won at Munich. In October 1942, he won at Warsaw/Lublin/Cracow. In December 1942, he tied for 1st with Junge at Prague. The tournament was sponsored by Germany’s Nazi Youth Association. In April 1943, he won at Prague with a score of 17 out of 19 and undefeated. In June 1943, he tied for 1st at Salzburg. The Gestapo gave Alekhine an exit visa, but would not permit his wife to accompany him. She had to return to Paris. In October 1943, he was invited to Madrid by the Spanish Chess Federation. He arrived too late (October 15, 1943) to take part in the Madrid International Tournament staged by the European Federation, which was played on October 4-20, 1943. A Nazi broadcast claimed that Alekhine went to Madrid to take part in the tournament, but was confined to a sanitarium shortly after his arrival. There were reports that Alekhine had been showing signs of a mental disorder. Alekhine did play in the "International Speed Game Tournament" that was held in Madrid on October 22. When asked if he knew about the controversy aroused by his articles against the Jews, Alekhine replied, “I swear I did not write a word of that.” (Moran). By 1943 Alekhine was spending all his time in Spain and Portugal as the German representative to chess events. After World War II he was not invited to chess tournaments because of his Nazi affiliation. In July 1944, he won at Gijon. After the event, he gave some chess lessons to prodigy Arturo Pomar. By that time he was severely depressed. He said that he continued to play chess because it occupied his mind and kept him from brooding and remembering (ChessBase). In 1944, his older sister died in the USSR. In 1944, Grace Alekhine won the women’s chess championship of Paris. Alekhine’s first disavowal of his anti-Semitic articles appears to date from just after the liberation of Paris in August, 1944. In 1944, he wrote Grau Torneo International de ajedrez Madrid, Oktobre 1943, published in Madrid. He also wrote Curso a Arturo Pomar, published in Madrid. By 1945, Alekhine was suffering from cirrhosis of the liver, duodenitis, high blood pressure, and hardening of the arteries. In March 1945, he won at Madrid. In July 1945, he tied for 2nd-3rd at Gijon, Spain. The event was won by A. Rico. During his time in Spain, he was technical advisor for the chess magazine Ajedrez Espanol. 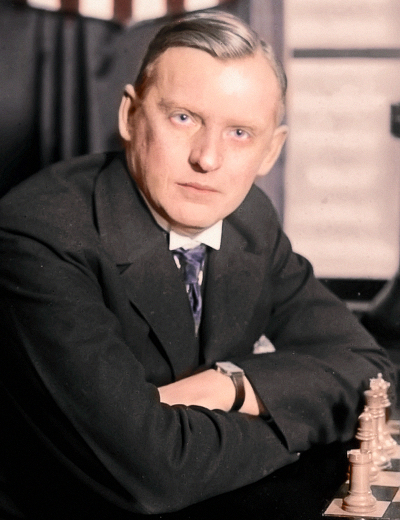 During World War II, Alekhine played in 16 tournaments, winning 9 and sharing 1st place in 4 more. In the autumn of 1945, he moved to Estoril, Portugal. In September 1945, the British Chess Federation sent Alekhine an invitation to tournaments in London and Hastings. Alekhine accepted the invitations by cable from Madrid. In October 1945, the United States Chess Federation (USCF) protested the invitation of Alekhine to the victory tournament in London. The USCF refused to take part in any projects or tournaments involving Alekhine. Protesters included Reuben Fine and Arnold Denker. In November, 1945, Alekhine was in the Canary Islands giving chess exhibitions and giving lessons to Arturo Pomar (born in 1931), who later became a grandmaster. In November 1945, a telegram arrived, signed by Mr. W. Hatton-Ward of the Sunday Chronicle, the paper that was organizing the victory tournament in London that, due to a protest from the United States Chess Federation, the invitations to tournaments in England had been cancelled. Shortly after, Alekhine had a heart attack. In December 1945, he said that none of the anti-Jewish articles were written by him. In December, 1945, Alekhine played is last tournament at Caceres, Spain. In 1945, Alekhine, Peres, and Aguilera wrote Ajedrez Hupermoderno: studio de las escuelas ajedrecistas a traves de una selection de partidas de grandes maestros de todas las epocas, published in Madrid by Castilla. Alekhine's last chess match was with Francisco Lupi at Estoril, Portugal in January 1946. Alekhine won 2, lost 1, and drew 1. In January 1946 a Victory Tournament was to be held in London. World Champion Alekhine was first invited by the British. The there were objections from the Dutch and the U.S. Chess Federation because of his articles of anti-Jewish content published under the signature of Alekhine. Some of the masters (USA) had threatened to withdraw from the tournament if Alekhine was invited. Alekhine was not invited to the event, which was won by Herman Steiner. Alekhine decided to return to France and to defend himself before the French Chess Federation. He applied for a visa, but Spain's borders were closed and the visa never reached him. In early March, 1946, he received a telegram from Mr. Derbyshire, the President of the British Chess Federation, transmitting a challenge to a match by the Russian champion, Mikhail Botvinnik (dated February 4, 1946). The Moscow Chess Club was offering $10,000 for the match. The match would take place in England subject to the British Chess Federation's (BCF) approval. Alekhine would receive $6,600 to play in the challenge match. Shortly after receiving the invitation, Alekhine suffered another heart attack. He soon recovered and accepted the challenge and started his preparation for the match. He was also working on a collection of Capablanca’s best games. In his last letter to the BCF, he asked if it was possible to get a visa to England from where he would most easily reach France. He also enquired whether a practice match with Dr. Tartakower could be arranged. On March 23, 1946, the BCF unanimously agreed to sponsor the match in England between Alekhine and Botvinnik. On the evening of March 23 or early March 24, 1946 (a chambermaid found his body at 10:30 am on March 24) Alekhine died in his shabby hotel room (the Park Hotel) in Estoril, Portugal (just outside Lisbon) at the age of 53. He was dressed in an overcoat to keep warm and slumped back in a ratty armchair with a peg chess set on the table and his dinner dishes in front of him. Kasparov says he died on March 24. Other sources say he died on March 23. A Portuguese news report states that Alekhine had beside him at the time of his death an anti-Nazi novel, Chosen Races, by Margaret Sothern. A Belgian violinist named Neuman, who had lived in the same hotel as Alekhine, had rushed to the room that morning when a waiter told him Alekhine was dead. He had observed that there were dinner plates on the table with a chess board and pieces on top of a support for suitcases. He saw Alekhine sitting in an armchair as if still listening to Neuman’s violin. AP reported that Alekhine’s body was found by a waiter (another source says a chambermaid) when he brought in breakfast. The waiter said that Alekhine was slumped at the table, and that the supper served on the previous day had not been touched, although his napkin was already tucked in. (ChessBase). However, police photos of the dead Alekhine as he was found in his hotel room do not show the napkin and all the food is gone. This had led to conspiracy theories of his death (murder or suicide). Pictures of Alekhine’s death look totally staged and his body looks arranged with his overcoat on, sitting in the armchair very calmly. The dinner plates are in front of him, arranged very neatly. The chessboard is set just to the side of him, set up in the original position with no moves made. It’s possible that the photographer prepared the scene by setting up a chessboard and pieces, along with dinner plates (but no knives or forks) in front of Alekhine. Some say he died of a heart attack (Hooper and Whyld). Others say he choked on a piece of meat. An autopsy took place at the Department of Legal Medicine of the Medical School of the University of Lisbon on March 27, 1946. Dr. Antonio J. Ferreira wrote the official death certificate, and said that the autopsy revealed the cause of death as asphyxia due to a piece of meat which lodged itself in the larynx. Years later, Dr. Ferreira claimed that Alekhine was shot. Brace and Kotov state that when Alekhine died, he did not have enough money even to buy cigarettes. Alekhine’s son later hinted that Alekhine might have been murdered by Soviets (Kasparov). Boris Spassky told Susan Polgar that he believes that Alekhine did not die of natural causes. One conspiracy theory is that the French Resistance created a super secret ‘Death Squad’ after World War II to deal with some of the people who had collaborated too willingly with the German Nazis. Dr. Antonio Ferreira later supposedly told friends that Alekhine’s body was found on the street, infront of his hotel room. He had been shot and Portuguese government pressure forced him to complete the death certificate that now exists. An overcoat was put over him to hid the bullet wound. Some medical doctors have commented on Alekhine’s death. Some point out that patients who become unconscious from a heart attack always fall to the floor and never remain sitting peacefully in chairs. If someone were choking to death, the gag reflex would kick in. Even an unconscious person would gag and cough, usually throwing out whatever is blocked in their airway and not die immediately. A conscious person would gag and struggle, moving around, knocking pieces over. A person choking to death would not end up in a calmly sitting position. The body was not buried for three weeks as no one claimed the body, which was in a mortuary in Lisbon. French consular officials said they had neither the funds nor instructions from Paris about a funeral. Finally, the Portuguese Chess Federation took charge of the funeral. Less than a dozen folks showed up for his burial in the Estoril cemetery on April 16, 1946. On April 10, 1946, Grace Alekhine wrote a letter to the CHESS editor that said her husband never accepted a salary nor the title of ‘Sachberator fur Ostfragen. She writes that Alekhine was offered a very advantageous position provided he became a Nazi, but he refused to to so. She said that he had no influence with any of the Nazi party leaders and never mixed politically. In 1946, Legado was published after Alekhine’s death. It was published in Madrid. In 1947 the FIDE Congress voted for Euwe to be the world champion since Alekhine died. However, the Soviet delegation was late for this vote. The next day, after protest from the Soviet delegation, the title was rescinded in favor of a match-tournament which Botvinnik won. Grace Wishart Alekhine died in 1956. After she died, the Aryan and Jewish Chess notes in Alekhine's handwriting were allegedly found in her effects by Brian Reilly (1901-1991), then the Editor of the British Chess Magazine. However, Reilly denied ever having seen the handwritten notes (Winter). The ceremony in Paris was attended by Alekhine's son, Alexander, who came from Switzerland, the Soviet ambassador to France, the FIDE president and vice president, Bronstein, Geller, Keres, Petrosian, Smyslov, Spassky, Ossip Bernstein, and several French players and journalists. Grace is buried next to Alexander. The headstone gives her maiden name as Wishar. On December 26, 1999, strong winds in Paris did considerable damage to Alekhine’s grave. The headstone monument was blown over, shattered and fell on the main gravestone. (ChessBase). The grave was later repaired and restored to its original state, except that a chessboard was replaced with the 90 degree rotation, showing the black squares to the right instead of the whits squares. In world championship play, Alekhine won 43 games, drew 73 games, and lost 24 games for a total of 140 games, with a 56.8% win ratio. He was world champion for 17 years, playing in 5 world championship matches. Alekhine played over 1000 tournament games, scoring 73 percent in his games. He played in 44 strong tournaments, taking 1st place in 25 tournaments and 2nd place in 8 tournaments. He took 1st place in 34 of 39 minor tournaments. His historical ELO rating has been calculated to be 2690. Over 2,700 of Alekhine's games survive. Alekhine played over 1,000 simultaneous exhibitions in his lifetime. Alekhine was a cat lover. He often played in tournaments with his cat "Chess" by his side. He wore clothes with cat designs. One defeated opponent said, "I knew I was in trouble when he showed up wearing that damned animal." Alekhine could speak in six to ten different languages and was most fluent in Russian, French, German, and English. Here are some short games of Alekhine. Caparros, Rogelio and Peter Lahde. The Games of Alekhine. Denker, Arnold. The Bobby Fischer I Knew. Divinksy, Nathan. The Chess Encyclopedia. Hooper, David and Kenneth Whyld. The Oxford Companion to Chess. Horowitz, I.A. The Personality of Chess. Kasparov, Garry. My Great Predecessors Part I.
Moran, Pablo. A. Alekhine: Agony of a Chess Genius. Schonberg, Harold. Grandmasters of Chess. Skinner, Leonard and Robert Verhoeven. Alexander Alekhine’s Chess Games, 1902-1946. Soltis, Andrew. Soviet Chess 1917-1991.